UK Release Date - 14th April 2003. Producer - Pete Woodroffe/Def Leppard. Live Track 03 - Recorded 7th August 2002 at Bayern 3 Radio in Munich, Germany (Joe/Phil/Viv). Live Track 03 - Mixed 27th September 2002 at Joe's Garage, Dublin by Ronan McHugh. GER Record Label - Island. Special Formats - CD1 Enhanced featuring LLWTG video. Special Formats - DVD Single with promo video/'Gimme A Job' audio. Special Formats - German CD Single (9800105-2) featuring 'Gimme A Job' - only CD release with this track. The second single from 'X/Ten' was released in April 2003. 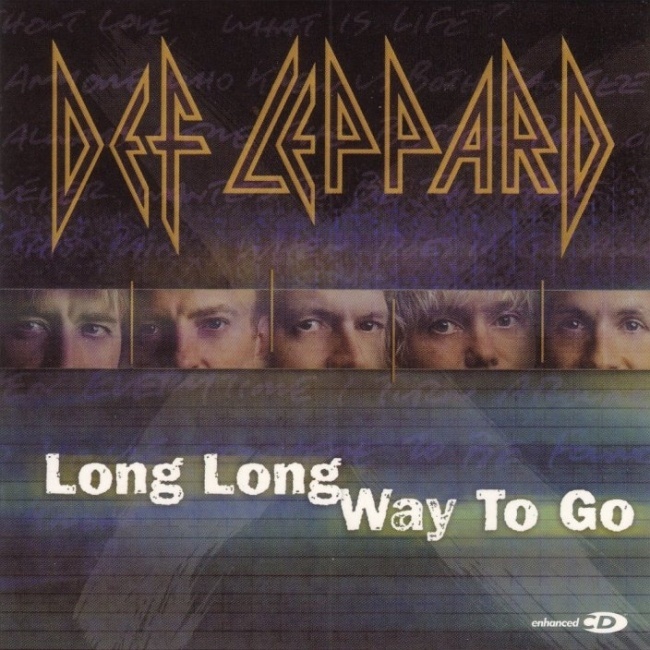 'Long Long Way To Go' was the first ballad released as a single in the UK since 'Goodbye'. The single was only commercially available in the UK and in some European countries like Germany. It reached number 40 in the UK charts. The single was released with an enhanced CD1 and for the first time a DVD single. The promo video features an end mouse scene only found on this DVD. A shorter version was later included on the 2004 'Best Of' collection. Two new tracks were included as B-Sides plus an acoustic live version of 'Now'. One of the new songs called 'Gimme A Job'... featured a guitar solo by Joe Elliott. The song was only released in the UK on the DVD single. The lead track was the radio edit although not mentioned as being one on the credits. The UK CD1 was enhanced with the promo video. A black screen appears with a promo pic of the band in the center of the screen and the video with control options in the middle. The video is an 40.1mb .mov quicktime file. The UK promo CD also featured a radio edit. It came in a custom slim digipak, the same cover as the UK CD1 single. Another radio edit promo CD-Acetate was released in a white Mercury paper sleeve with the titles in black on the front. In May 2003 a German CD single was issued featuring the radio edit and 'Gimme A Job' - it's only known release on CD. The single was initially advertised online with four other tracks among the B Sides. These were - 'Hysteria' (live acoustic on German radio 2002) and 'LLWTG' and 'Now' (live in Japan 2002). In the end these three songs were not included as part of the singles set. "Joe plays the solo, nothing to do with us!." (Gimme A Job)."